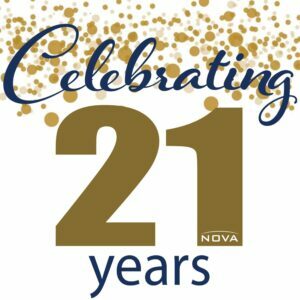 NOVA proudly celebrates 21 years of excellent client service. Co-founder and Principal Barry Roziewski put pen to paper and shares his thoughts on the story of NOVA. “Early on Walter, Dave and myself put our trust in one another and the NOVA dream was set in motion. It was a little scary but we quickly realized that if you do your best and treat people the way we would want to be treated, things would work out. It’s really amazing to think about how far the NOVA family has come. We can all be proud of the many projects and clients we have served since 1996. Today, I am thinking about all the wonderful folks that have been part of the NOVA family since 1996. Your loyalty, contributions and caring hearts have set us apart from so many others in our industry. As a result, many clients have asked us to expand our geographic reach into other markets simply because of the service we provide. Our clients value the fact that we truly do help protect the civil population, while providing creative and responsive solutions to project challenges encountered daily. NOVA is well positioned to be a leader throughout the Southeastern US, primarily due to the outstanding service our employees provide each and every day. Surrounding ourselves with the best in the industry, affords us the ability and resources to solve tough problems. Our clients look to the NOVA family to do just that! In the coming years, NOVA will have the opportunity to serve more clients, on more high-profile projects, than the 3 of us would ever have imagined. I challenge our staff to continue to do what has become common place for NOVA – make every day the best day. We have accomplished a lot together during our first 21 years and empowered countless people to realize their full potential. But what matters most now is what we do next.